Bottom soles are slightly dirty. Insoles and inner linings are slightly dirty and show wear. Length (Heel to Toe): 11.5". Insoles: 10". Were not a pair of my own. Orthaheel Cable Knit Indoor/outdoor Slippers. 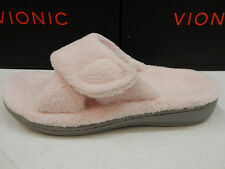 Vionic Relax Plush Light Grey Slipper Slide Sandal Women's Sizes 5-11 NEW!!! These tend to run a little small. I would go up a size for optimal comfort. Indoor/Outdoor soles. Synthetic outsole. Vionic Relax Plush Black Slipper Slide Sandal Women's Sizes 5-11 NEW!!! Treat your feet! Perfect for keeping the chill out during those midnight snack runs. From Vionic. 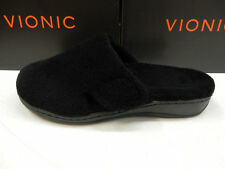 Vionic Orthotic Quilted Slippers w/ Bow Detail - Pleasant. Quilted with delicate bow detail, faux-fur trim. Vionic Relax Plush Ivory Slipper Slide Sandal Women's Sizes 5-11 NEW!!! Length (heel to toe)-12". Bottom soles are slightly dirty and show signs of very light wear. Insoles and inner lining are slightly dirty and show very little wear. Heels and toes of both shoes show no wear and are very clean. Bottom soles are slightly dirty and show signs of very light wear. Insoles and inner lining are slightly dirty and show very little wear. Length (heel to toe)-12". Insoles-11.5". Width-4.5". Heels and toes of both shoes show no wear and are very clean. NWOB Vionic Pleasant Women's Slippers Orthotic Support Synthetic Slate Grey 10M. Shipped with USPS Priority Mail. Soft and comfy mule slippers w/ hook-and-loop adjustable closure. Flexible EVA midsole. Soft and comfy mule slippers w/ hook-and-loop adjustable closure. Just like all websites we use one picture for all sizes. The picture is for visual presentation of the style and does not represent the size. Soft and comfy slippers. Received APMA Seal of Acceptance. adjustable hook-and-loop closure.